After my trip to China, it was time to finish my project in the Barrens. This offered me the opportunity to have a crack at the mud sunfish once more, and I leapt at the opportunity. I returned to the same lake once more, and was greeted by bluespotted and banded sunfish. 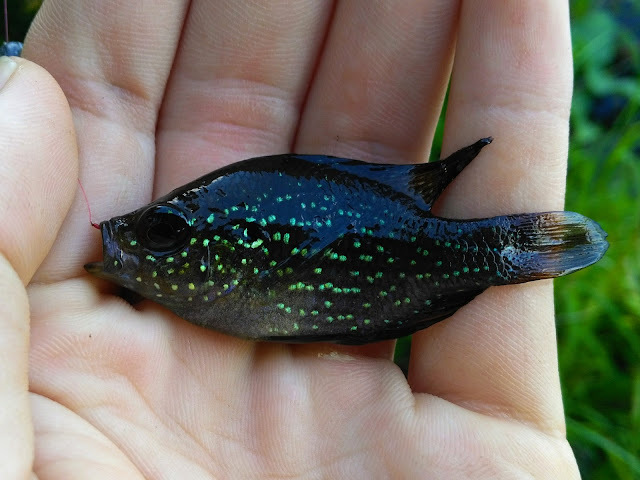 I caught one which was particularly handsome; the spots were more green than blue, and they stood out sharply on the black body. 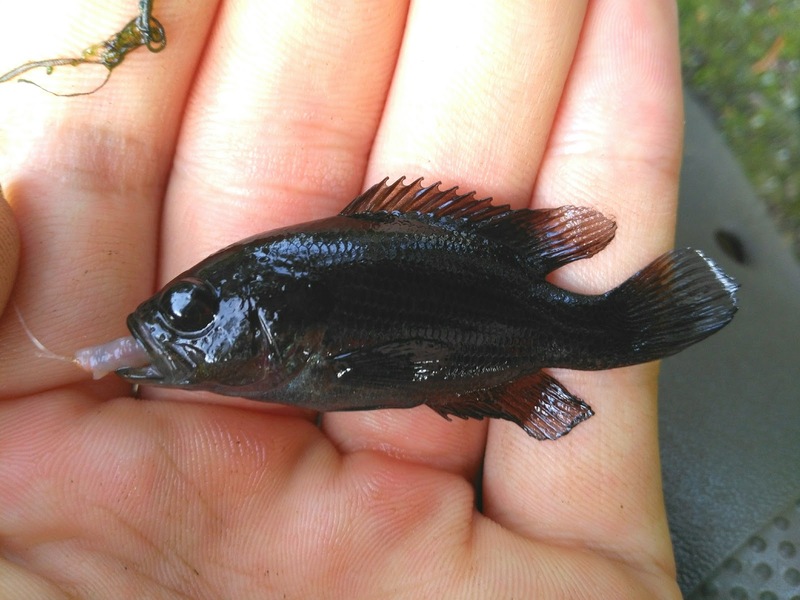 As the previous round had shown me, the mud sunfish have a comparatively much larger mouth than its Enneacanthus counterparts. The tanago hook was a bit small, so with this in mind I tied on a size 16 fly hook with a much larger piece of worm. 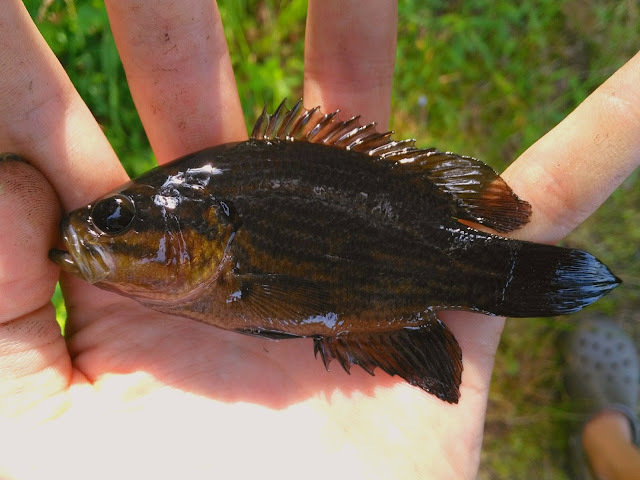 I had read that mud sunfish like the darkest crevices so I focused my attention on shadowy, weedy, woody shallows. Lo and behold, in one of the dark spots, I received a savage strike but no hookup. I repeatedly dropped my bait down, only to get bit and not hook anything. 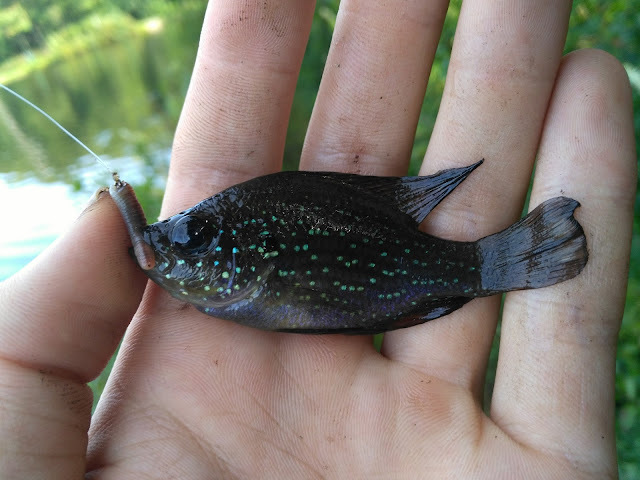 I suspected it was a small sunfish, so I dropped the worm down once more and let it sit a bit on the bottom. When I tightened my line something was on! 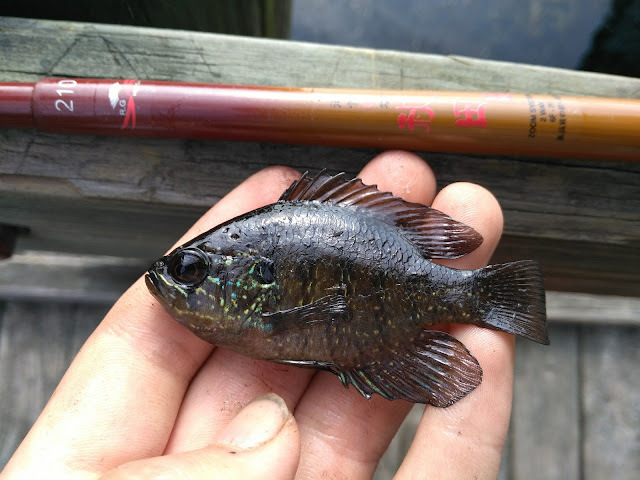 I was a little surprised to see a tiny mud sunfish on the end of my line! I had caught my target, this was species #104. This handsome little specimen was dressed in black, but I wanted a slightly larger one, so I kept at the effort. More fishing resulted in several more ambitious Enneacanthus. 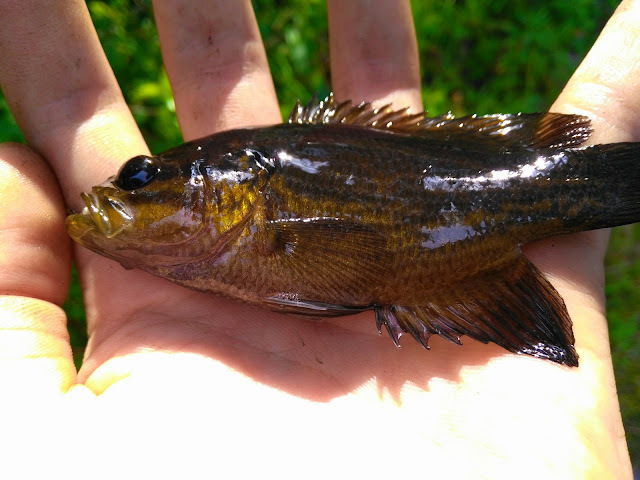 It was nearing sundown again, and I still didn't have my more impressive mud sunfish specimen. 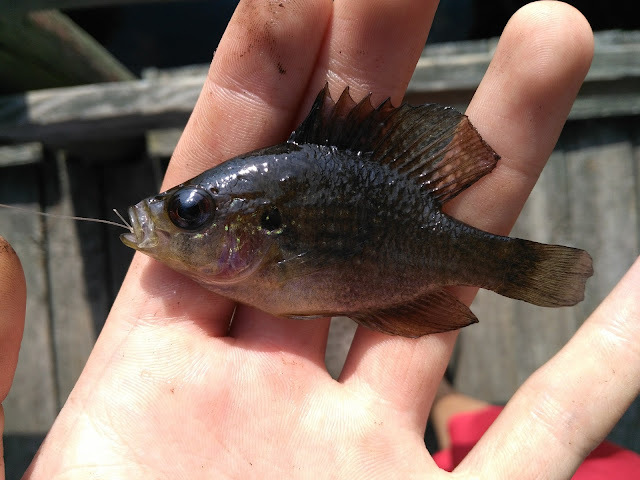 I tried placing my bait farther from shore among some weeds, and out swam a much larger mud sunfish which engulfed my bait. I set the hook, and the fish came flying out of the water—only to drop back in, falling more than a foot to the water's surface. Heartbreaking. I kept at it though, hoping the fish stayed in the area. Not 3 minutes later, the bugger decided he was hungry again and this time I carefully dragged him to shore along the surface after a short but spirited fight on my microfishing pole. Not all that large, but it was exactly what I had been hoping for. A success.